Oundle Fire Station in Northamptonshire has been crowned champion of a national recycling competition in aid of The Fire Fighters Charity. The retained fire station collected a staggering 1.46 tonnes of recycled clothing and textiles in January to see off competition from over 450 fire stations across the UK. After coming third in last year’s recycling competition, the crews at Oundle Fire Station fervently rallied their friends, families, and neighbours to support The Fire Fighters Charity by making a donation of their unwanted clothing in the fire station’s textile bank. With the support of their colleagues from across Northamptonshire Fire and Rescue Service, Oundle Fire Station clinched first place in the national competition, ahead of their nearest rival Bedford Fire Station who successfully recycled 1.36 tonnes of textiles. 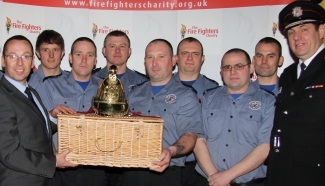 Third place went to Chatteris Fire Station in Cambridgeshire, with 1.25 tonnes, following an impressive public campaign to help Cambridgeshire fire stations increase their collections across the county. Chief Fire Officer Martyn Emberson of Northamptonshire Fire and Rescue Service said: “Recycling is the one thing we can all do for the environment. It's easy, it's simple, and it saves natural resources as well as energy. Recycling your unwanted clothing at The Fire Fighters Charity’s textile banks is a great way to support injured fire fighters. "Over the last year, the scheme has raised over £250,000 for the charity, which has enabled hundreds of fire fighters take part in rehabilitation programmes. This in turn helps injured fire fighters return back to work much more quickly – fighting and preventing fires, and saving people from serious road traffic accidents." The Fire Fighters Charity’s national recycling scheme sees wearable items are sent to developing countries to help those who are experiencing situations resulting in extreme poverty, with un-wearable items recycled into other day-to-day products such as car insulation and furniture padding. Chief Executive John Parry of The Fire Fighters Charity explained: “There was a fun but competitive edge to our national recycling scheme and we were amazed by the efforts of the 450 fire stations that took part. In total we collected over 98 tonnes of clothing during January 2013, compared to just 80 tonnes in the same month last year. "Thanks to the fantastic donations of unwanted clothing, including a few dodgy Christmas socks and jumpers no doubt, we managed to raise over £22,000. Add to this another £6,000 from other clothes collections such as door to door and school collections, which will go directly towards helping members of the fire service community." The competition also saw some outstanding performances from individuals who took it upon themselves to make their own collections. Cumbria’s Egremont Fire station trebled their collections to 670 kilograms compared to last year, following the hard work of David McDowell who went out collecting old clothes from friends, family members, and local households. Fire Fighter Sharron Finch at Lichfield Fire Station in Staffordshire kindly donated over 30 bags of clothing, whilst in Strathclyde the competition saw great efforts from Steven McKay, Watch Commander at Greenock Fire Station and Andrew McCrory at the Operations Support Centre in Johnstone. The income generated by the textile recycling scheme is at no cost to The Fire Fighters Charity, as the costs are borne by the recycling companies that the charity is partnered with. Such costs include the manufacture of the textile banks, the production of recycling bags, the collection, sorting and distribution of the clothes, and additional marketing materials to promote the recycling across the UK to fire and rescue services and the general public.